EGA Products 10 Step Fixed Cage Ladder, 12' 8" Overall Length, Steel Safety Cage, 300 lb. Weight Capacity. EGA Products 12 Step Fixed Cage Ladder, 14' 8" Overall Length, Steel Safety Cage, 300 lb. Weight Capacity. 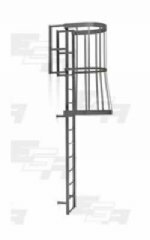 EGA Products 14 Step Fixed Cage Ladder, 16' 8" Overall Length, Steel Safety Cage, 300 lb. Weight Capacity. EGA Products 16 Step Fixed Cage Ladder, 18' 8" Overall Length, Steel Safety Cage, 300 lb. Weight Capacity. EGA Products 18 Step Fixed Cage Ladder, 20' 8" Overall Length, Steel Safety Cage, 300 lb. Weight Capacity. EGA Products 20 Step Fixed Cage Ladder, 22' 8" Overall Length, Steel Safety Cage, 300 lb. Weight Capacity. EGA Products 22 Step Fixed Cage Ladder, 24' 8" Overall Length, Steel Safety Cage, 300 lb. Weight Capacity. EGA Products 24 Step Fixed Cage Ladder, 26' 8" Overall Length, Steel Safety Cage, 300 lb. Weight Capacity.